Like nearby Red Breaks, Big Horn Canyon is an interesting tributary of Harris Wash in a rarely explored part of the Grand Staircase-Escalante National Monument. It runs for three miles through hilly, shrub-covered land between the wash, the Escalante River and highway UT 12, cutting into Navajo sandstone rock layers that here display an unusually wide range of colors, textures and formations. 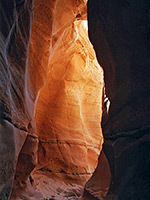 The canyon deepens quickly, eventually reaching a depth of 400 feet, and forms slot-like channels of varying narrowness mixed with wider, flat sections. It has two forks and all could be seen in five hours though adjacent parts of Harris Wash, and especially some of its nearby side canyons, are also worth visiting so this time could be increased to one long day. Big Horn Canyon starts a few miles along the Old Sheffield Road (also known as Spencer Flat Road), a variable quality sand/gravel track that leaves UT 12 to the south about half way down the grand descent from the grasslands of Big Flat into the Escalante River drainage area. The starting point for the first hike described here is 2.8 miles along this road and is not evident in any way apart from being just after a distinctive conical sandstone dome to the north. Alternatively, the canyon can be approached from the lower end - this requires either a 2 mile walk along Harris Creek from where it crosses the Hole-in-the-Rock road (5 miles from UT 12), or by a cross-country hike of 1 mile, beginning at Tenmile Flat, 2 miles further south on the same road. TopoQuest topographic map of Big Horn Canyon. It is about 100 yards from the road to any one of several shallow branches that form the head of the east fork of Big Horn Canyon. The main ravine soon becomes around 200 feet deep but there is not much of note until after 20 minutes walking, when the canyon enters the first narrow channel and soon after has a dryfall of about 30 feet, passed by walking down the left hand side. 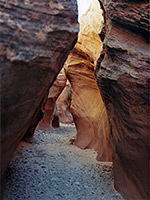 Thereafter the canyon has other enclosed passageways of increasing length separated by open, sandy areas. The deepest section is reached after one hour and includes a drop of 8 feet into a circular pothole. This can be downclimbed, but going back up is harder and the obstacle may need to be bypassed, by climbing above the cliffs on the east side. The rocks become ever more colorful and have many shades of pink, yellow, brown and red, with thin, inclined strata that are eroded into domes and small ravines, formations similar to those found in parts of Capitol Reef National Park such as the land around Burro Wash. 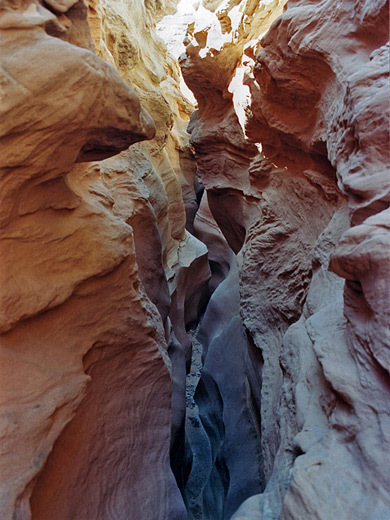 Towards the lower end, the canyon has almost half a mile of narrows, some of which is just 2 feet wide and angled away from vertical, and so has to be traversed sideways. Although not particularly deep (20 - 30 feet), this section has very pretty patterns and eroded curves. It ends soon before the junction with the west fork, which has a similar good slot a little way upstream, then the main canyon meets Harris Wash just 200 yards further - this drainage is much wider and has a stony wash winding between vertical Navajo sandstone walls with sandbanks at either side. Harris is not especially noteworthy at this point, but as it continues southeast towards the Escalante River the wash is joined from the north by several short, scenic side canyons. The west fork is a smaller drainage, a shallow valley for most of its length until about half a mile north of the junction with the main east branch, where it enters a very pretty section of narrows. This location could also be reached starting from the Old Sheffield Road but much shorter is the route from the Hole-in-the-Rock Road - parking where this crosses Harris Wash and walking downstream for 2 miles, initially along an old track, to the junction with Big Horn Canyon which is the first major tributary on the north side. Or, for a loop trip, walk downstream just for 100 yards, head north for half a mile up a side channel that enters a small canyon, then walk cross-country eastwards, meeting the west fork a short distance above the narrows, and return down the main wash. This area north of Harris Wash is generally quite open, but contains scattered sandstone domes and cliffs with colorful, swirling patterns in the rocks. The slot starts where the surrounding land changes from predominantly sandy dunes to all rock. A dryfall leads to some short narrows that can be explored easily only as far as a tight drop, difficult to pass but avoidable if the canyon is explored from below - it can be re-entered after walking along the west rim for about 10 minutes. 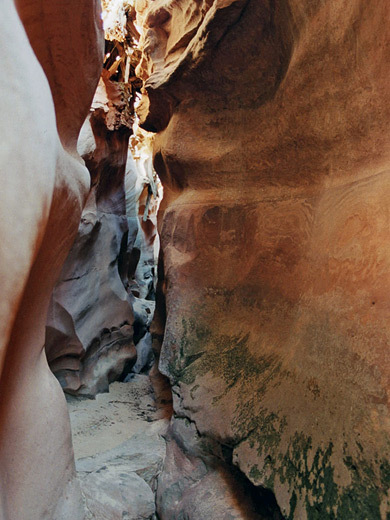 Below this drop is a moderately deep stretch of pretty, curving slot canyon, quite dark in places as the rocks overhang above, and often with some shallow pools. 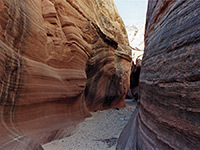 The walls have similar wavy bands as are found in the domes and cliff faces above the canyon. All can be seen in about 15 minutes but this part of the west fork is very photogenic and has a variety of different rock forms in its short length.